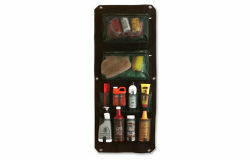 The Window Tack Organizer is made of sturdy Black Nylon with Green mesh pockets. A 1 1/2" Nylon strap is sewn around the edges for extra reinforcement. Six metal grommets and twist lock mounting hardware allow for quick and sturdy attachment to any vertical surface. Features two zippable large pockets and eight open top pockets.